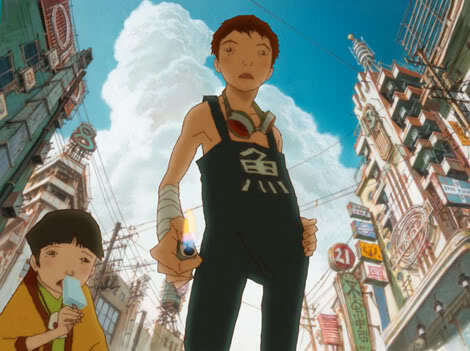 Based on a manga by Taiyo Matsumoto, “Tekkonkinkreet” was about two children aimed to protect their city from people who either wanted to change the city for the better or demolish it altogether to build an amusement park. Although the medium is animation, the story is not for children because it is very violent and the issues it tackles are geared more toward adults. While I did admire its ability to take risks, it did not completely work for me because it started out as a story grounded in reality but elements of the paranormal or fantasy somehow was added into the mix. It became really confusing, especially toward the end, not only because the movie simultaneously showed events that were actually happening in the real world, it also showed what was in the characters’ heads, and possibly scenes of the future. Perhaps the reason why I didn’t quite get it was because I needed more background information. But then again I always judge a film as a stand-alone piece of work; it should be able to hold up without having to read the source from which it was based on. Undoubtedly, there were some positive things such as the intense chase scenes and the imagination embedded in the metaphysical and surrealistic scenes. Directed by Michael Arias, I wish “Tekkonkinkreet” had less visual stimulation and instead worked more on its emotional resonance. I was interested in the two main characters’ relationship with each other and their society. It would have been a great opportunity to explore how their role as homeless kids, who had to steal from citizens and live in an abandoned car, was directly affected by cops who really cared about their well-beings (and vice-versa). What I love about animes and animated features in general is that it is limitless when it comes to giving its audiences images and emotions. However, there are those animes that simply fail to get me to care or keep my attention due to that lack of balance between the two. Unfotunately, this film is one of those animated pictures that left me bewildered in a negative way.